A winner at The International Design & Architecture Awards 2018, this cottage has been brilliantly transformed by Hancock Architects and Denai Kulcsar Interiors into a spacious, light-filled family home with the kitchen at the heart. Our Perrin & Rowe Phoenician tap in pewter is a jewel in the kitchen crown. A minimalist bath in a bay window allows the exquisite leadlight windows, original sandstone walls and luxury bath tapware from Perrin & Rowe to be the heroes of the space. On the opposite wall a striking full-length black vanity brings this room into the 21st century. 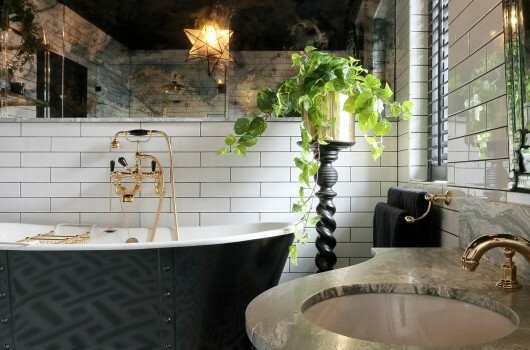 Perforated metal sconces, pewter tapware, moody dark vanity and glazed tiles create a masculine bathroom with a distinctly industrial vibe. The feminine curves of a custom vanity, with soft pewter tapware and accessories layered on pretty textured tiles, echo the French influences throughout the home. 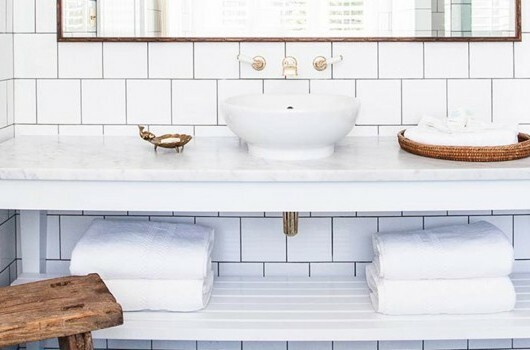 Always the place to be whimsical, the powder room does not disappoint with period style bathroomware and charming antiques set against a wall of sandstone. The owner runs Le Marche Antiques and many of these beautiful pieces have found their way home.